The Artificial Ear Type AE3000 is a complete test jig for measurement on telephone handsets requiring an IEC 60318 coupler. AE3000 ear simulator has a similar performance to the Type AE1000 ear simulator in acoustically, and according to ITU-T P.57 Type 1 recommendation and the IEC 60318 standard. Artificial Ear Type AE3000 consist of an acoustic coupler, pressure condenser microphone and preamplifier and a snap coupling, which all parts are made of stainless steel and no any magnetic material. •Fits directly into the Telephone test positioner or HATS. The coupler fits 1/2 inch pressure Microphone and 1/2 inch Microphone Preamplifier mounted in the housing. The coupler also mounts directly on the preamplifiers by the Adaptor Ring supplied. 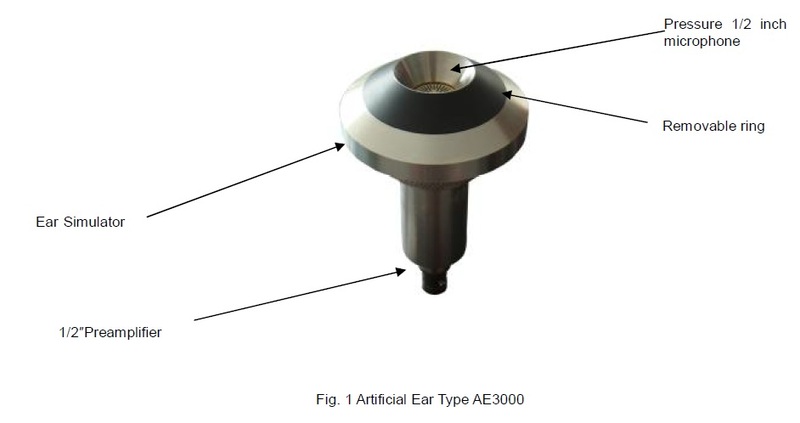 Artificial Ear Type AE3000 fulfils the requirements of IEC 60318 and is defined for simulating the acoustical load of the human ear under no leakage conditions. The acoustic coupler contains three volumes (V1 = 2.5cm3, V2 =1.8cm3 and V3 = 7.5cm3) and acoustically connected in parallel by a narrow annular slit and four parallel holes. • Audio analysis system, which can generator test signal and analysis the recording signal from the DUT.